The Friends of Boscombe Chine Gardens have produced a Tree Trail Leaflet, which you can also download and print. You can use the Tree Trail leaflet and go on a circular walk round the gardens to identify nine different trees. The Squirrel Café, a small but cosy café located at the Christchurch Road end of the gardens overlooking the mini-golf course and lodge flower beds. 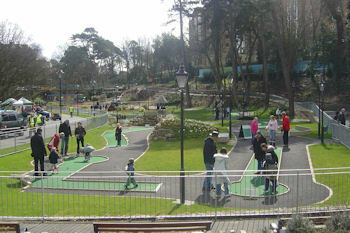 The mini-golf course is located at the Christchurch Road end of the gardens adjacent to the Squirrel Café. Did you know that the 2009 BMGA British Doubles Championship was held on this course! 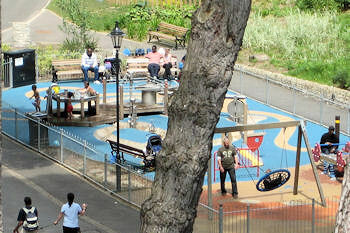 The children's enclosed play area incorporating an innovative water feature is located in the middle of Boscombe Chine, roughly half-way between the Clock House Café and Boscombe Pier. In February 2012 we secured some Local Improvement Fund money from the East Cliff and Springbourne ward councillors to refurbish (paint) the three totem poles by the crazy golf course. Kate Arnold, the original artist/carver agreed to undertake this refurbishment work, which was completed in March 2012 and we are delighted with the result. Kate was keen not to cover the poles with paint that would flake but to use an oil based wash that would enhance the natural beauty of the wood. If you take the time to closely study the totem poles, you should discover subtle shading that blends in with the carved animals and a colour wash that allows the natural cuts and grain to show through. 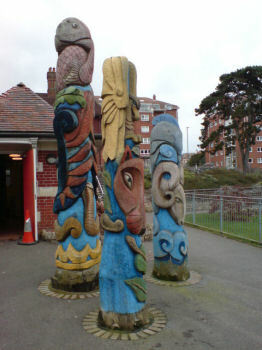 The three totem poles were originally commissioned in 2006 as part of the Lottery funded Boscombe Chine Gardens’ makeover. The design of the totem poles was inspired by children from Linwood special needs school working in conjunction with other local school children along with the artist Kate Arnold. The children’s two dimensional designs were the inspiration for the final carvings. The three totem poles individually represent water, fire and earth. The smallest totem pole (water - the symbol for life) has a dolphin on top with a ram below and waves lapping at the bottom. The largest totem pole ((fire) has two salmon at the top with a raven and serpent below. You will also find an olive branch on the totem pole and flames flickering at the bottom. The middle sized totem pole (earth) has an eagle at the top clutching a fish with a fox below. Towards the bottom there are seed pods and leaves. Historically, the different animals carved represent different attributes, although definitions vary depending on their geographic origin, a brief description is given below. In 2008 Boscombe Chine Gardens became Bournemouth's 10th Local Nature Reserve. Following Boscombe Chine's 2006/7 restoration project, additional wildlife has been attracted to the area to take advantage of the improved habitat. Among the wildlife that can now be found along the chine are gatekeepers, meadow browns, small coppers and small skipper butterflies along with azure and large red damselflies. Other insects occurring are, beetles, spiders, meadow & common grasshoppers, sand & digger wasps and various species of ant. Along with the usual common and garden birds that you might expect, stonechats and green woodpeckers can be seen. Part of this nature reserve has been designated a site of nature conservation interest, due to the existence of some rare species of plant. The Children's Nature Trail was funded by the Friends of Boscombe Chine Gardens through a funding application to the Community Small Grants Scheme. We commissioned SHARP - Action On Addiction, to carve the 12 Question & Answer posts. To stimulate learning and an interest in nature, the Question & Answer posters are changed on a regular basis. 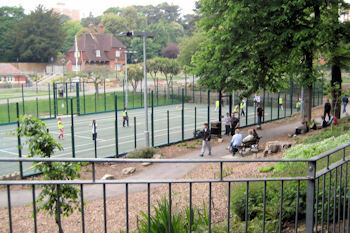 The Multi-Use Games Area (MUGA) is located at the Christchurch Road end of the gardens. It is totally enclosed by a secure but transparent purpose built fence. Inside the area on a special playing surface, games such as basketball, netball and football can be played. 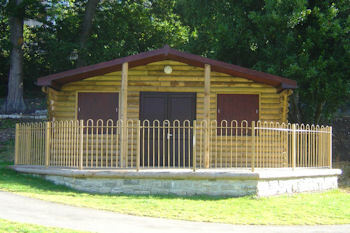 The Education Centre or Ed Shed as it is affectionately known is next to the MUGA and serves various functions. A scheme for the development in what it described as the 'picturesque Village of Boscombe Spa' was prepared for the Malmesbury Estate in about 1866 or 1877 to make available building plots for the erection of marine villas to be let on long leases. The Spa was related to a natural spring of mineral water containing properties similar to Harrogate which had been discovered near the foot of the hill; this would be available for invalids and could combine the advantages of a Spa with those of sea air and bathing. The scheme was not implemented; instead about 19 acres of land was obtained by Sir Henry Drummond Wolff, on part of which he built a house for himself named Boscombe Towers, in 1868, Sir Henry became closely associated with the development of Boscombe Spa for a considerable number of years. The Bournemouth Land Train route was extended in spring 2011. The train now goes up Sea Road and into the Boscombe shopping precinct. 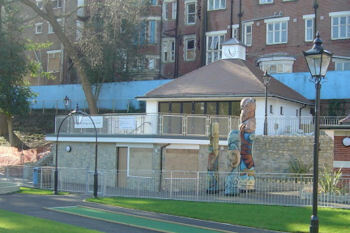 It then travels along the Christchurch Road and down into Boscombe Chine Gardens, stopping at the upper spa shelter. It then continues down through the gardens back to Boscombe Pier and along the seafront to Bournemouth.